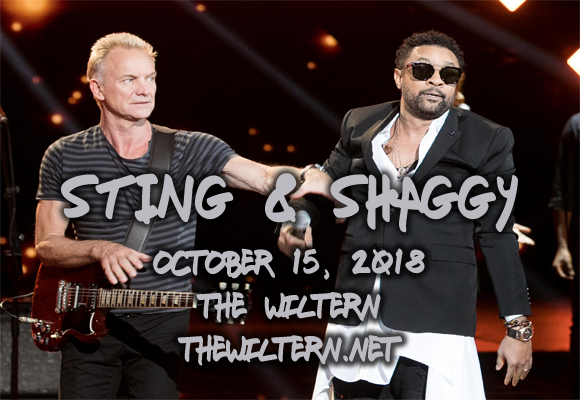 Keeping the summer vibes strong, Sting & Shaggy will be performing at The Wiltern on Monday 15th October 2018! Bringing their laid-back reggae-tinged grooves to the stage, the pair will be performing collaborative efforts like "Don't Make Me Wait" from their effortlessly cool new album 44/876, and chart-topping fan favorites like "Message In A Bottle” and “It Wasn’t Me”! Get your tickets now for this island-inspired dream team! Sting is an English singer, songwriter, and actor, who served as frontman and founder of the wildly successful English new wave rock band the Police from 1977 to 1986. Launching his solo career in 1985, he has now become one of the world's best-selling artists, having sold over 100 million records as a solo artist and with the Police combined. A highly-awarded artist, both as a solo artist and with the Police he has won sixteen Grammy Awards, three Brit Awards (including Outstanding Contribution in 2002), a Golden Globe, an Emmy Award and four nominations for the Academy Award for Best Original Song. He was inducted into the Songwriters Hall of Fame in 2002, the same year he received the Ivor Novello Award for Lifetime Achievement from the British Academy of Songwriters, Composers and Authors. He has also been awarded several honors over the years: in 2003, Sting received a CBE from Elizabeth II at Buckingham Palace for services to music, in 2014 he was made a Kennedy Center Honoree at the White House, and he was awarded the Polar Music Prize in 2017. Jamaican singer, musician and DJ Shaggy had his first hit in 1993 with “Oh Carolina”. He had several worldwide hits throughout the 1990s and 2000s, with singles like "Boombastic", "It Wasn't Me", and "Angel". Rising to fame with his Grammy Award-winning 1996 album Boombastic, Shaggy has released 13 studio albums to date, including his six-time platinum album Hot Shot (2000), and 44/876 – a collaborative album with Sting.